Available through Small Press Distribution or Kore Press Website. Pomegranate Eater’s “radiant host” lives where fecundity meets decay, where the orderly Victorian garden explodes in wild tendrils. In rich and densely-layered confections, these poems invite us to devour self after self as the text’s shifting speaker builds and rebuilds an identity in language. 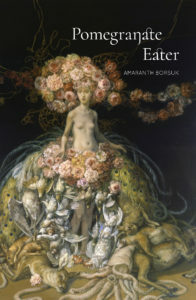 Through prose poems interrogating the self in the guise of various fruit, epistles obliquely addressing a shadow lover, and dense lexical tapestries whose words seem to point only away from meaning and toward one another, Pomegranate Eater lets language speak, directing our gaze at its shimmering surfaces. Poems from Pomegranate Eater have appeared in The Chicago Review, Colorado Review, Columbia Poetry Review, Denver Quarterly, Drunken Boat, Eleven Eleven, FIELD, Emohippus Greeting Card Series, Harp & Altar, New American Writing, Ocean State Review, Pleiades, and Poetry Flash. Reading from Pomegranate Eater at CU Boulder, September 2016. Reading with Sarah Mangold at Open Books, Seattle, May 21, 2016. “Dear Botfly,” Seattle Review of Books (January 12, 2016). “Parable In Which One Wrestles A Double,” “Allegory In Which A Gregarious Knife Is Buried,” and “Apologue With Substitutions In Which A Shift Is Made,” Berfrois (February 28, 2014). “Shifting Shapes,” Woodland Pattern (2014). “Dear Drawn,” Poetry Flash (2013). “Wood Nexuses I” and “Baking Blind,” Eleven Eleven: journal of literature & art (2010). Paul Constant. “The Poet Next Door: Notess, Mangold, and Borsuk.” Seattle Review of Books (June, 2016). Greg Bem. “Poetry Review: Pomegranate Eater.” Queen Mob’s Teahouse (September, 2016). rob mclennan. “Amaranth Borsuk, Pomegranate Eater.” May 2017. Ariel Kusby, Bone Bouquet 8.2, Winter, 2018. Reader’s Guide, including biography, reviews, interview excerpts, writing prompts, and links.